The Postmaster's House Museum happened to become the first in Russia museum of a book character - of the warden of a post road station who was described by Aleksandr Pushkin in one of his stories. Pushkin is probably the most loved, cited and published poet in Russia. His beautiful crystal verses, both simple and meaningful (unfortunately, losing much in translation) are first learnt in early childhood as short poems and fairy tales. Later they are followed by his lyric and philosophic poetry and prose. Being praised by every regime after his death, Pushkin grew into a symbolic and even cult figure for a Russian speaking person. No surprise that monuments to Pushkin or streets of his name can be found in many Russian cities. The Postmaster's House Museum adds its special tribute to Aleksandr Pushkin national worship and, also, displays Russian rural culture interiors and artifacts and provides a historical overview of postal service in Russia in the 19th century. "Clean Section for Travellers", "Coachmen Room", "Local Post Office in the Second Half of the 19th Century" and "The Open Storage of the Museum Funds" display. Supported by the Aleksandr Popov Central Museum of Communications, the Station Keeper Museum was founded on October 15, 1972. It is located in the still preserved former building of the Vyra post road station where travellers of the 18-19th centuries changed horses for their coaches. The old roadpost here marks 'the 69th verst"(72 km) of the highway heading from St. Petersburg to Pskov. 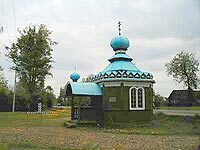 A rural roadside chapel is reconstructed next to the station entrance (architect A. Semochkin, 1980s) housing the religious processions on church holidays of Kozma and Damian celebrated yearly on July 14 and November 14. Another event attracting many guests worldwide including Pushkin's descendants - Aleksandr Pushkin's birthday - is traditionally celebrated every June both in the village of Vyra as Pushkin Holiday and in the town of Gatchina nearby as the movie festival "Literature and cinema". The museum is a center of youth education arranging 5-year training cycles of "The Young Postmaster School" where kids study history of mail service in Russia in practical seminars and exciting games. Donations and contributions substantially support the museum activities. A branch of the museum - The House of Aleksandr Pushkin's Nanny- was opened in a nearby village of Kobrino in 1974. It occupies the only wooden construction that has survived in the village since the 18th century, where a talented surf peasant woman - Arina Rodionovna- lived before coming to her masters' house in Moscow to nurse young Pushkin and tell him fascinating stories that later transformed into his fairy tales. Traditional interior of a peasant's house of the late 18th-early 19th centuries is presented here.